FB0002 A Reclaimed, Georgian Reproduction “Register” Firebox. 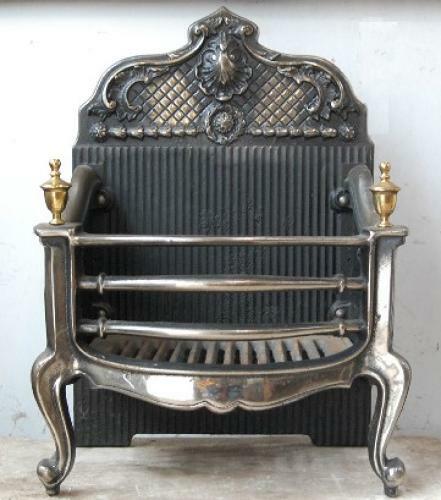 A lovely cast iron and brass reproduction fire register with traditional design on the backplate. The register has the firegrate and front bars intact. The register has a lovely serpentine edge and legs and attractive brass finials. The register is a heavy and quality item that is useable and in very good condition. The firegrate does have some small areas of surface rust and the back has surface rust. There is some slight discolouration to the metal which would benefit from polishing. As expected of reclaimed items, there are some slight signs of use and wear. Some small scratches and marks are visible. A lovely register that has a very pretty design and is fully functional. The register would add great character to a hearth and is a desirable item.